Many invasive therapies involve an intra-arterial approach. Some procedures can be categorized as percutaneous coronary interventions. The most effective procedure is selected based on the extent and severity of the disease. 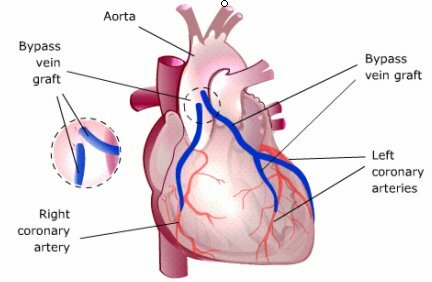 Revascularization and restoration of blood flow to the myocardium is the primary goal of any procedure, whether it is intra-arterial, transmyocardial revascularization, or bypass graft. PTCA is performed in conjunction with cardiac catheterization. A catheter with a small, elongated, inflatable balloon on the distal end is passed into the diseased coronary artery. The catheter tip is pushed through the lesion and the balloon is positioned in the center of the lesion. The balloon is then inflated with a solution of contrast material to permit fluoroscopic visualization. The inflated balloon compresses the atheromatous plaque against the sides of the arterial wall, improving blood flow through the previously stenotic vessel. To date, about 30% to 40% of patients undergoing this procedure experience restenosis of these arteries. When patients are evaluated after PTCA, increases in luminal diameter and regional myocardial perfusion are observed. One complication associated with this technique is coronary dissection resulting from the balloon compression. If this should occur, immediate coronary artery bypass surgery is required. Transluminal endarterectomy or atherectomy is a therapeutic intervention for the removal and retrieval of a thrombus or an atherosclerotic plaque. Several devices have been developed that scrape, shave, or cut the plaque within the lumen of the vessel. The excised material is collected in a distal collection chamber and is removed completely, in contrast to angioplasty which simply compresses the plaque. As with other procedures requiring catheterization, complications such as perforation and arterial dissection may arise. The rate of restenosis is approximately 20% to 30%. Major problems associated with PTCA are restenosis of the coronary artery or acute intraprocedural vessel closure. The FDA approved intracoronary stents as a solution to these problems in 1992. In addition, randomized clinical trials demonstrate a reduced need for repeated revascularization at 6 months following intracoronary stent insertion. One complication associated with intracoronary stents is clotting. Stents are composed of metal or polymers, which are foreign materials that are in contact with blood. Since blood clots when it encounters foreign material, a thrombus may form within the arterial lumen. An added complication may be lysis from the stent to create other circulatory problems, such as stroke. To decrease clotting, heparin-coated stents have been utilized. These stents also allow for the administration of lower doses of anticoagulation therapy. In addition, investigators are evaluating the combination of stent implantation with temporary implantation of radioactive seeds to control scar formation. Special polymers have also been developed that coat the interior of the artery, hardening into a smooth arterial lining that reduces the chance of restenosis. The latest development in intracoronary stents focuses on stents that expand. TMR is an invasive surgical technique for treating CAD. The FDA approved TMR using the eximer laser in 1992. This technique utilizes a laser to create channels in the ischemic myocardium, thereby providing direct blood flow to the oxygen-deprived muscle. Because of its sponge-like structure, the myocardium normally derives small amounts of nourishment directly from the blood in the left ventricle. This phenomenon of self-perfusion occurs both in the healthy heart as well as in the ischemic heart. TMR takes advantage of this natural phenomenon. Surgical bypass of occluded coronary arteries to increase myocardial perfusion may be the only means of preventing death in patients who do not respond to other treatment. A surgical procedure called aortic-coronary or coronary artery bypass graft (CABG) is performed by anastomosing small vein grafts to the aorta and to more distal coronary vessels. Usually one or several grafts are performed during the procedure, each of which supplies a peripheral coronary artery beyond the stenosis. The purpose of revascularization is to increase blood flow and oxygen supply to the ischemic regions distal to the obstructive lesion. Anginal pain is relieved in about 80% of patients who undergo CABG. Thrombolytic therapy, PTCA, and/or atherectomy should be considered prior to surgery if the patient meets the selective criteria for those procedures.